I've been wanting to try out a photo blanket ever since I saw them at the Walmart photo center. I finally got one recently, and it turned out absolutely gorgeous! 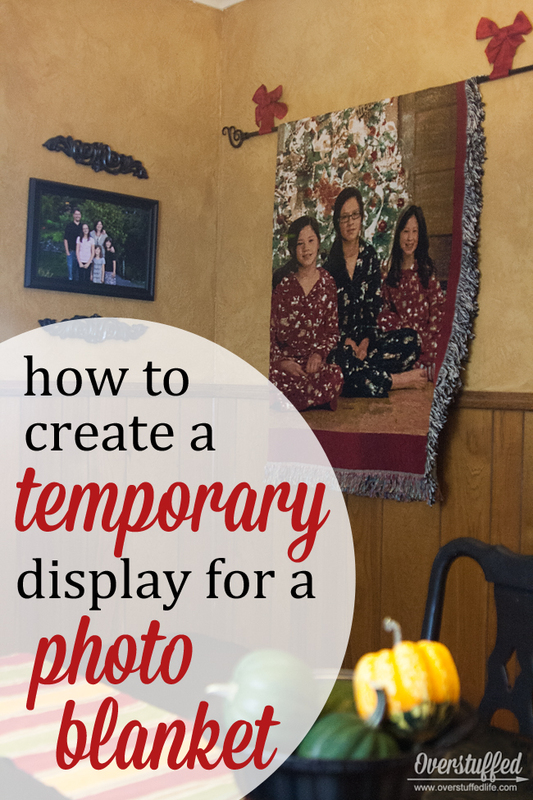 It was so gorgeous, that I wanted to find a way to somehow display it, but since I used holiday photos, I knew it needed to be a temporary display that was just for the holidays. First, let me show you just how beautiful this blanket is! You can go with fleece, plush fleece, or the woven throws. I'm a sucker for the woven throws, so that is what I chose. I chose the 60x80 size because I wanted it to be a warm blanket we would actually use as a way to keep warm while watching Christmas movies together. Even though I knew I wanted to also display it while it wasn't being used for giving warmth, I didn't think about just how large that size was—it takes up my entire couch! Still, it's big and beautiful and I love it, even though I don't have a blank wall in the whole house that is big enough to show the whole thing! 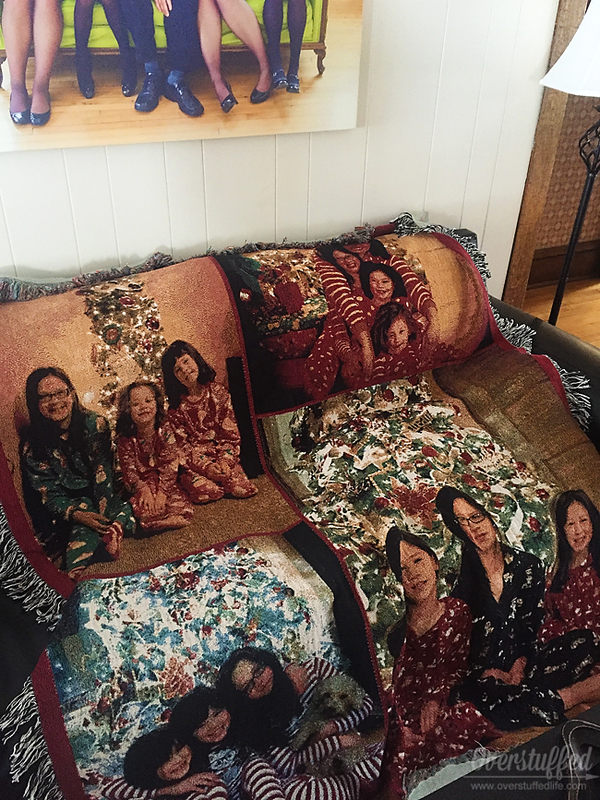 It was super easy to upload my favorite Christmas photos and design the blanket. The Walmart online photo center makes it very user-friendly and quick, and the blanket was delivered to my house within the week. I knew I wanted to do a curtain rod display on the wall, but I did not want to be drilling holes in my wall or have a permanent curtain rod there. I ruminated on that a bit, and I came up with a really simple solution using the velcro Command strips for picture hanging. You will need to do a little bit of sewing, but I promise it's super easy. 1. Cut two pieces of burlap ribbon approximately 12 inches long each. Fold in half, and sew a line about one inch from the fold. I left the threads hanging on the above image so that you can see what that should look like. 2. 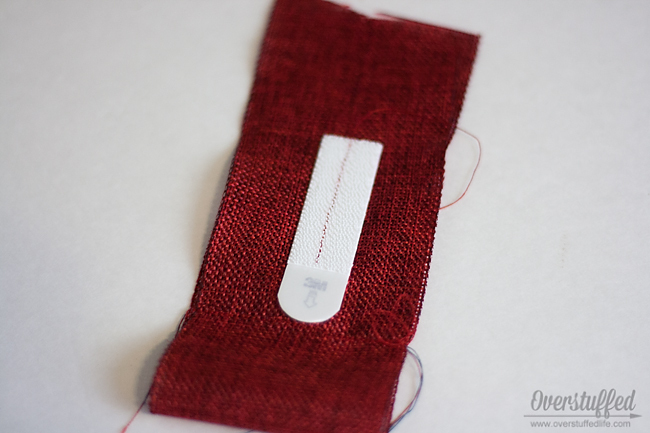 Take the adhesive strip off of a velcro Command strip and sew it above the loop you just created. I just sewed one line straight down the middle of the strip. 3. Trim all your threads. 4. Attach the other velcro strip to both of your burlap hangers, and attach them to the wall where you want to hang your curtain rod. Make sure you have measured how wide the rod needs to be, and hang the burlap strips a little bit narrower than that. 6. 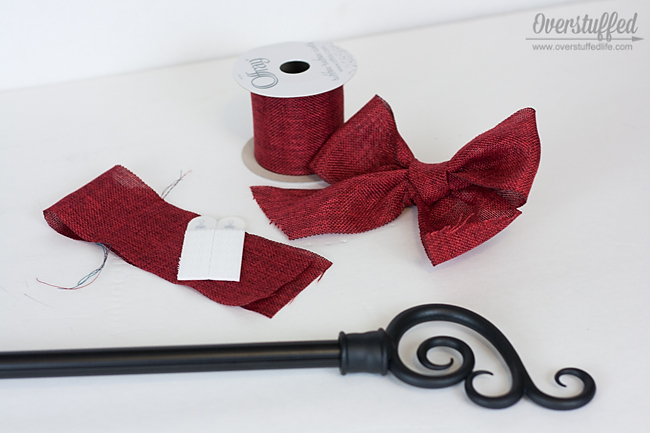 Finally, make some ribbons out of your burlap ribbon and hot glue them to the outside of the ribbon that is attached to the wall. Voila! Now I can enjoy this beautiful blanket all the time, and not just when we're all cuddled under it! I wasn't sure at first how strong the velcro would be, but I wasn't too worried since I've taken to using those strips to hang all my big picture frames, too. It has held wonderfully! 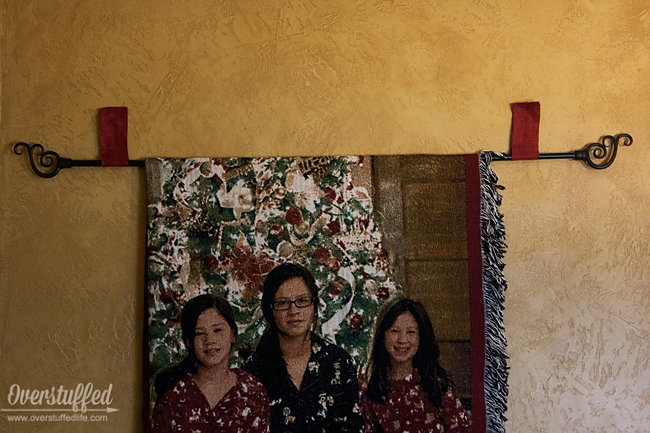 Want to make your own beautiful photo blanket? 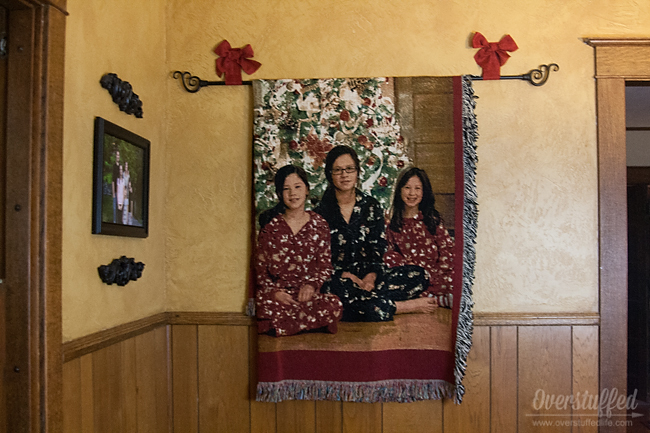 Go check out the options at the Walmart Photo Center here: Photo Blankets at Walmart. For the latest posts from Overstuffed, subscribe by email, or follow me on Facebook.